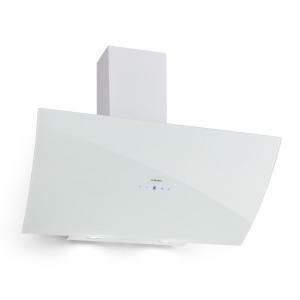 The Klarstein Annabelle 90 cooker extractor hood is an attractive addition to medium to large kitchens. It attracts odours and vapours reliably and thus ensures a pleasant indoor climate, even during elaborate cooking activities. Klarstein's Annabelle is a powerful head-free hood that, with its upwardly sloping shape, allows effortless views into the rearmost cooking pots while it moves up to 650 m3 of air per hour. If required, two bright 2-watt LED lamps illuminate the cooking area below. All settings can be conveniently made directly on the front of black safety glass by touch control. Three dishwasher-proof grease filters made of aluminium protect the exhaust air duct and the interior from contamination. The clear and at the same time elegant design with white glass makes the Klarstein Annabelle 90 cooker hood a wonderful addition to any kitchen ambience and is a real visual highlight. The extractor hood can be converted to recirculation mode with the help of two activated carbon filters (article 10027530).